Given the quiet holiday week, we stepped back to think about some of the bigger developments in the global economy. Here’s one that few are discussing but that seems inevitable. BACKGROUND: WHAT IS DEBT MONETIZATION? This term gets thrown around a lot, so here’s a quick review of what it really is. When you get paid for your labor you monetize your labor. If you sell your house or take a home equity loan, you’re monetizing the current market value of your house. Bribery is an example of someone monetizing their position of influence. The term printing money usually implies that newly created money is used to directly finance government deficits or pay off government debt (also known as monetizing the government debt). When governments print money (and expand the money supply) to buy their own bonds, they are monetizing their debt, literally bonds into cash. In the short run this is a painless way for them to spend more than they receive without raising taxes or cutting services, both of which are unpopular and can end political careers. The risk is that if money supply expands too much, then under the right conditions (the money circulates quickly enough, the supply of goods and services doesn’t expand as quickly as the money supply, as the rate of increasing consumer and business spending, credit expansion etc.) prices rise (inflation) and the currency loses value and purchasing power. That can happen slowly over decades, as has been the case with the USD. See 7 CHARTS TELL WHY WE ALL NEED CURRENCY DIVERSIFICATION for details. In extreme cases, confidence in the value of the currency collapses completely, resulting in hyperinflation. It’s similar to when a company issues new shares and increases the number of outstanding shares by 5%. Unless the company does something to be worth 5% more, the value of the existing shares has been diluted. Here are the reasons the EU is likely to begin outright monetization of debt (aka money printing in 2014). As discussed here, the EU is stuck in a long term private sector credit contraction. EU banks have preferred to lend to the GIIPS and other EU sovereigns rather than make riskier commercial loans. This trend has accelerated with the ECB LTRO program making GIIPS bonds a better option than commercial loans. The coming ECB bank stress tests further discourage banks from lending to all but the most creditworthy borrowers, further draining cash from the system. As discussed below, this liquidity crunch is hindering the ECB’s own ability to support GIIPS bond prices without outright debt monetization aka expanding the money supply. The ECB currently helps maintain GIIPS bond prices and low borrowing costs by buying them via its SMP (secondary market purchases) program with money it electronically creates out of thin air. It claims this is not money printing/outright debt monetization because it then sells other bonds it owns to financial institutions and thus in theory withdraws an equal amount of cash from the system, keeping the money supply unchanged. This isn’t really true, because those who buy the bonds from the ECB can borrow from the ECB using those same bonds as collateral, thus potentially bringing the cash right back, but never mind. However in recent weeks EU bank liquidity has worsened, so even that polite semi-fiction may be changing. 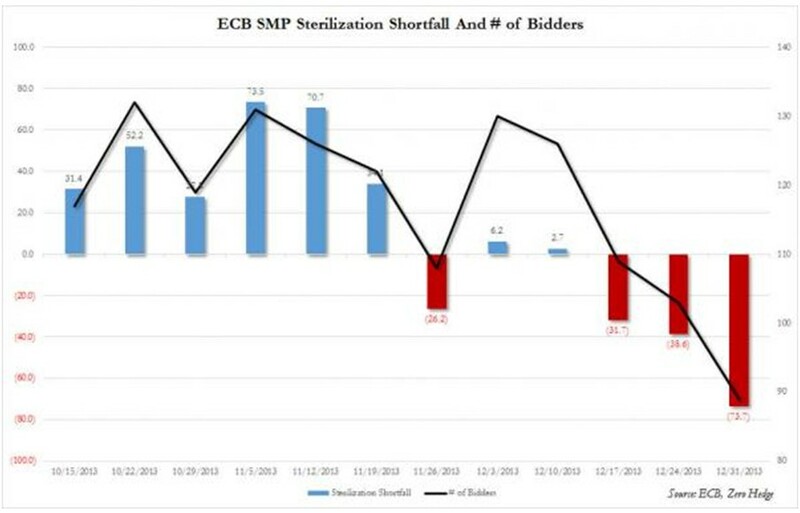 As reported by zerohedge.com, in December the ECB has had 3 failed bond sterilizations. Out of about 543 bln euros worth of bonds, it could only sell about 398 bln, leaving 145 bln of unsterilized bond purchases, outright debt monetization, buying bonds with electronically created cash. See here for details. In an apparent reversal of prior policy, EU banks are not as eager to buy sovereign bonds, and would prefer having cash, despite the loss of interest income. If this pace continues, in early 2014 the ECB’s bond purchases may remain on its balance sheet fully unsterilized. But that’s ok – now even Germany is slowly starting to habituate to central bank activity with no fears what this may mean for future inflation. Because it, like subprime, is contained. Finally, since even the theatrics of ECB’s bond buying sterilization are fading, can it be long before the ECB proceeds to monetize debt outright, and unsterilized? The EU is going to need an anticipated 50-90 billion euros just to fund bank recapitalizations or closings expected in the wake of coming ECB bank stress tests. As we wrote here and here, there is currently no common EU fund to pay for that, and as in prior years, the GIIPS are unlikely to be able to bear that cost without endangering their own solvency and sparking a bigger crisis. However the ECB won’t run realistic stress tests knowing that if it reveals an undercapitalized bank without a safety net already in place, it could spark a new EU banking crisis. Yet if EU bank reforms and centralized oversight are to proceed, those realistic stress tests are needed in order to reveal, resolve, or close undercapitalized banks before they become the EU’s common headache. The alternative to outright debt monetization , per bank BNP Paribas’ Paul-Mortimor Lee, is that the ECB should follow the Fed and BoJ with its own big fat QE program. See here for details. Granted, QE in the US has not exactly sealed off the deflation threat either, nor is it so but that’s a separate discussion. However it’s arguably a better way to supply liquidity and keep rates down without expanding the money supply. See here for a good brief explanation. One thing is clear. The EU needs to find a way to get a lot of cash ready for the coming year. So what are the alternatives to more unsterilized bond purchases like we’ve seen this past month? A European style QE.As with the ECB’s current bond sterilization program, there is some question as to whether the difference between QE and outright money printing is much more than a technicality. See here for details. In sum, Germany and its hard money allies will need to accept either outright unsterilized bond purchases (aka expansion of money supply or money printing) or its QE variation. Yes, either policy choice risks inflation once the rest of the EU’s economies and spending levels start to recover. The real risk of another EU sovereign or bank solvency crisis that arrives long before the EU figures out how to fix itself. The one thing that’s clear is that something is going to explode in the EU – either the supply of Euros, or the EU itself. If the EU prints, it can buy time to save itself and repair its banks. If not, the whole EU experiment is at risk from a sudden lack of cash. When and how that plays out is unclear. Given the coming EU banks stress tests, and the need for those to happen and be rigorous, we bet that 2014 us the year that Germany decides to either print money and risk EUR devaluation, or it takes a few of its hard-money allies and walks. For those whose assets are based in the EUR, as well in in the USD, JPY, GPB, or other currency at risk of debasement over the coming years (as we’ve seen for decades with the USD), here’s an award-winning guide to a variety of safer, simpler ways to hedge that risk even if you never trade currencies.